Why should just elders have all the water fun? A sensory bath tub is a perfect idea to make your infant have some fun in water. All you need is a bath tub, objects of various textures, shapes and sizes and an inquisitive baby. Put a rubber ducky, a few plastic straws, handkerchief, a wooden toy etc. in the tub and let your baby explore this watery treasure hunt. They might be too young to paint but with the zip-lock paint trick, age is no bar and no mess either! “Take a big zip-lock bag and squirt in three different coloured paints into it. Now, seal the bag with a scotch tape without blending the paint. Place it on the floor and handover a brush to your baby and see him/her creating fun patterns sans any mess,” suggests Delhi-based Aarti Ahluwalia, a mother to two girls. We are not asking you to put your baby out in the rain. But, when tiny rain drops are pouring take your baby in to the balcony or near a window where she can stretch her arm and feel the droplets in her hands. Don’t forget to capture that first expression in your camera! Who said, you have to take your baby in the rain to have some watery fun? Use the kitchen sink or basin! But before you let your baby sit in there, line it with a big towel to avoid injury. Once there, put on the tap and see your little one enjoying the water flow from the faucet. Once your baby can sit on his own, you can invite some kids of similar age and organize a pool party. “Buy an inflatable swimming pool, dress them up in their cutesy swimming attire and you are ready go! Don’t forget to keep their feeding bottles, water sippers and their favourite finger foods! Caution: Parents supervision solicited,” shares Bangalore based Nidhi S. a mommy to 7 months old girl. Rains are all about fun-filled mess. So, to add into to the fun and mess, make edible paint for your babies. While you won’t have to bother about what’s going inside their mouth, they’ll have lots of messy, gooey fun while painting the town red, blue and green. There are many recipes of edible paint available on internet. Your little crawlers would love this one! Convert your bed or the floor into an obstacle racing track using pillows, blankets, sheets etc and let your little ones free. They would have a gala time find their way over and under the obstacles. Rain fun cannot be complete without paper boats. But rather than going out and about in the rain sail your boats in a bath tub in your balcony, while rain drops play magic outside. “Let the rules be for some other day! It’s okay to let your kids soak, splash, crawl, walk, jump and run and do all that in the rain at times. But don’t forget do clean them well with an anti-bacterial soap after all the dirty fun,” says Rahul Kakkad, a Mumbai-based father to a year old girl. 10. It’s raining for toys! So, what if kids cannot get drenched every time it rains, their toys can! So, next time your kids want to have some wet fun, let them give their toys a bath – in the sink, a container or just throw them in the bathtub with your little one! “Not exactly in the rain but as it rains outside, let your child make the sliding glass door his canvas with window markers. Your child would love to paint his imagination on such a huge canvas as raindrops make their own pattern on the other side,” suggests Pune baed mother, Preeti Madan. Don’t kid loves playing nooks, corners and under the furniture in the home? While going out for a picnic isn’t possible during rains, but the next time it rains pull out a big table on the terrace, garden or backyard. Convert this into a perfect picnic spot by throwing a plastic table cover and squeezing under it. Don’t forget to stuff your picnic basket with all your child’s favourite delicacies! How about organizing a puppet show for your little one and his friends right inside your home? Make puppets using old socks, wool, newspaper cuttings etc. Let internet be your teacher. Create a stage in the doorway using a betsheet low enough that the kid can peep out while he tells a story. Isn’t it fun? Take two buckets of water. Fill one with water and leave the other empty. Now, comes the fun part. Ask your kid and his friends to take turns to fill one bucket from another using small plastic glasses. You might have to clean the mess later, but kids will fir sure have a gala time! “There can be many variants to this game. Ask your kid(s) to dig out all yellow toys from their toy box. One who collects maximum would win. Or all animals out or for that matter, take out all blue toys. It’s be a fun-filled series of games that will keep your little monsters busy for a long time. Don’t forget to keep prize for the winner and the runner-up!,” says Mumbai based Deepali Khattar, who is a mother to two boys. Yet another interesting game that your kids will not only love but would also understand what belongs to which place. All you need to do is, take an object from any room and ask your child to keep it at its right place. For instance, a sauce pan should go back to the kitchen and bucket in the bathroom. 18. Play dough on the go! Get your kids to create things that they can associate with rains – animals like frogs and worms, umbrella, boots, clouds etc. If they get bored, you can let their imagination go wild and create anything that they like. You can learn to make play dough at home on internet. Nothing can entertain your kids on a cloudy day like a party where they can let their hair down with their friends. Have this party at your home and besides finger-licking home-made snacks throw in games and activities like a paper boat race, ‘sing a rain song’ contest and musical chair and you have a day well spent! “What’s a better way to face a rainy day than by preparing for a rainy day? Forget monsoon blues and indulge your kids in painting some umbrellas with waterproof paints. Fun, creative and a great way to welcome monsoons in a colourful way!,” suggests Mahi Goel from Mumbai. Pull out all those board games and have a family board game marathon. Let juices flowing and snacks coming in as you and your kids unravel levels after levels in your board game battle. Use this stay-at-home time to explore the chef in your child. Engage him in some interesting cooking or baking with you. And if they are ready, then let them be the master chefs for the day as you sit back, relax and sip your coffee. On a serious note, this could be your first step towards introducing your child to a new hobby and making him independent too! “Nothing gels better with a rainy day than a movie marathon. Download movies or simply rent them and get on to a movie marathon watching back to back movies with your child. From your child’s favourite movies to films you always wanted to watch with your kid. Bring them on! Don’t miss out on popcorns!,” says Vishakha Katyal, mother to a five year old. This one is perfect to bring the entire family together. It’s one of the best forms of open ended play, where your child can spend hours making interesting creations. Give wings to their imaginations or join in for a flight together and create a master piece. “How about doing some cool craft work? Let your child come up with an interesting idea or hop on to google for some inspiration and put that craft box to use. Make some birthday cards for your family members or bookmarks that will inspire your little one to read. 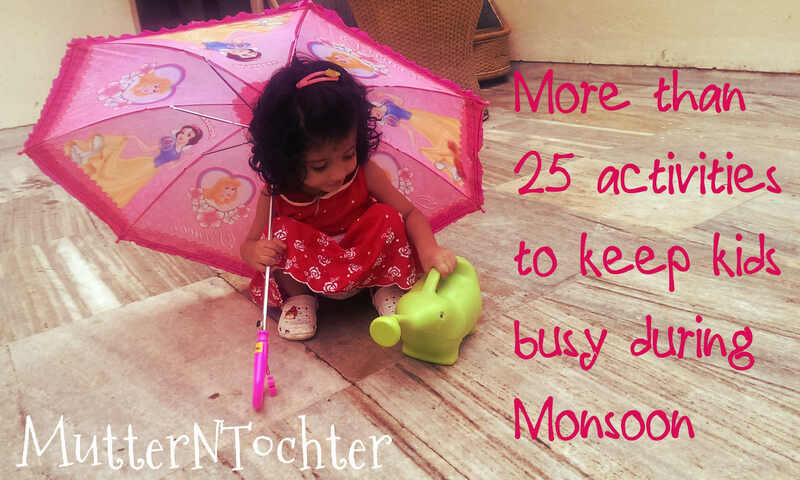 Think, create and beat the monsoon blues!,” suggests Mitali Bhadoria, Mumbai based mommy to a four year old girl. As it pours outside, introduce your child to music. Make your own jal-tarag. Fill different sized ceramic / metal bowls with water and ask him to hit each with a stick or a spoon. Every bowl will make a different sound and add melody to the rainy day. You can also engage your kids in learning some other musical instrument too. Kids will love this! You can hide a set of objects –candies, balloons toys, books etc. at various locations in your home. Give a small basket to every kid and let them embark on the hunt. Kids will happily play this for hours and the one who loots the maximum things can take home a prize! “How about hosting a rainy fashion show in your balcony? As it pours outside, create a runway in your balcony and let your kids dress up in anything they like- Mommy’s dress or papa’s shirt! They might come up with some wacky attire too – you never know these little fashionistas! Let them strut their stuff while you play their front row audience sipping your cuppa,” suggests Himani Malik from Delhi. Books are for all seasons! But to make them perfect to suit the weather, pick up titles that shout monsoons, rains and water. Some suggestions: Come on Rain by Karen Hesse, Who likes Rain by Etta Kaner, Rain Brings Frogs: A Little Book of Hope by Maryann Cocca-Leffler.